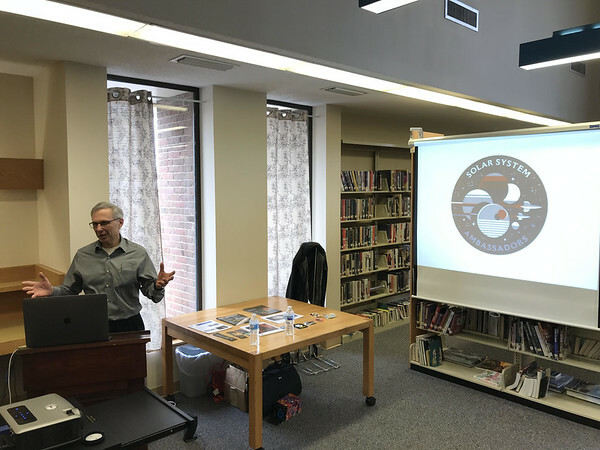 BRISTOL - NASA/Jet Propulsion Laboratories Solar System Ambassador Andy Poniros gave guests to the Terryville Public Library a crash course on the history of the Mars rover missions and steps scientists are taking to study the planet and prepare for an eventual human landing. 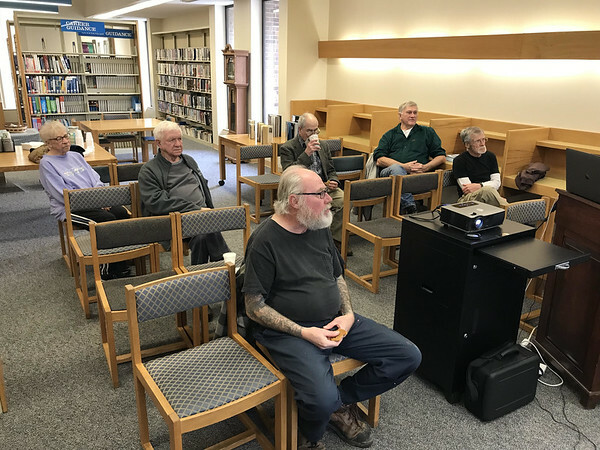 Six local seniors attended the program, which Poniros has been presenting as a volunteer ambassador, using information provided to him by NASA and JPL scientists, for 15 years. 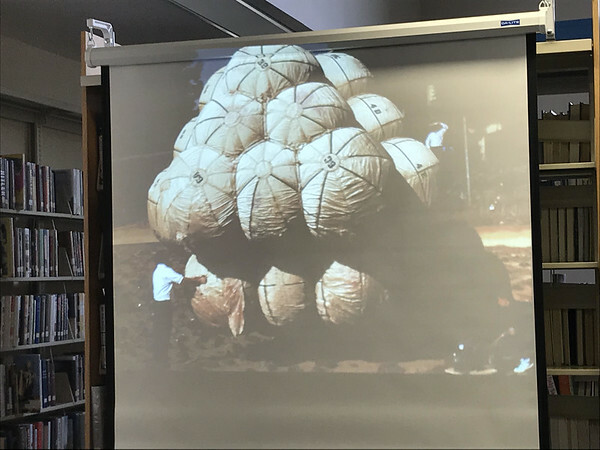 “When I started learning about this subject matter, I felt that I had to tell everybody about it - it’s just amazing,” he said. Poniros is also a science reporter, an electrical engineer, an amateur astronomer and runs a monthly radio podcast. He is also a member of the Astronomical Society of New Haven. Poniros began his presentation by discussing some of Mars’ more interesting features. The planet is half the size of Earth with gravity only 38 percent as strong. It has a trench, Valles Marineris, which runs for 2,500 miles - the equivalent of New York to Los Angeles. It also has a dormant volcano, Olympus Mons, two-and-a-half times the size of Mount Everest. A day on Mars is 25-and-a-half hours long and a Mars year is 22-and-a-half Earth months. Mars has an atmosphere 100 times thinner than Earth’s, mostly made of carbon dioxide, and temperatures which range from negative 200 degrees Fahrenheit to 70 degrees Fahrenheit during the summer around the equator. It takes around 20 minutes to send a radio signal from Earth to Mars. However, even with Mars’ thin atmosphere, it is enough to make landing on the planet much harder than landing on the moon. 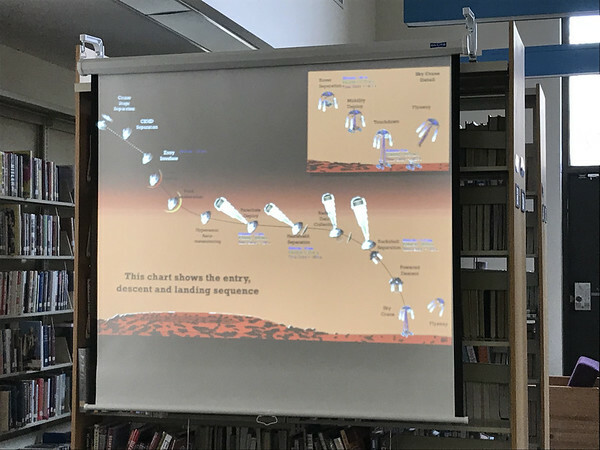 Poniros showed a table with a history of Mars missions. Between 1960 to 1964, most probe missions were failures. In 1964, a probe returned with 21 photos of the planet and the first time anything landed on the planet was 1975. During the 1980s and 1990s, scientists focused on making spacecraft better, faster and cheaper. 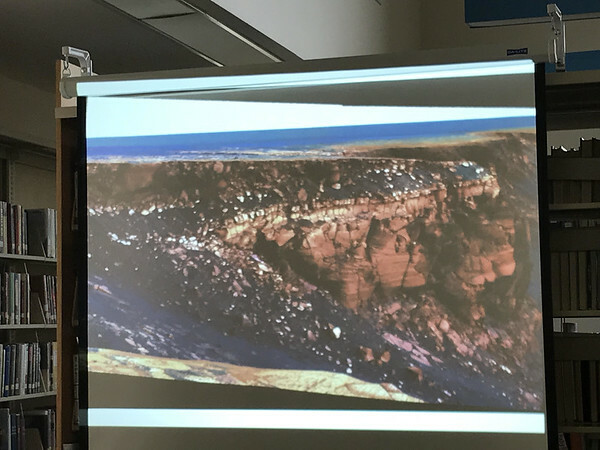 Poniros discussed the history of the Mars rover projects as well as how they are programmed to sense obstacles, seek out different rock formations, extract and analyze samples. Rovers were able to determine that Mars had water covering its surface 4 billion years ago, before Earth had water. However, it was more caustic, with Poniros comparing it to Windex. Today, there may still be water beneath the surface, but liquid water cannot exist on the surface of Mars and instantly turns into a gaseous state. The rovers mentioned were Pathfinder, which lasted from July 4 to Sept. 27, 1997, to Spirit and Opportunity which landed in 2004. Spirit was operational until 2011, eventually becoming trapped in sand. Opportunity was buried by a dust storm last year, blocking its solar panels. However, a wind storm may eventually unbury it. Curiosity, the most recent rover, landed in Gale Crater, which could fit Connecticut inside and has a four mile high mountain, in 2012. The crater, it was discovered, was once a lake which held drinkable water. The mountain is comprised of sediment. This probe is also analyzing samples for evidence of biological methane, which would suggest that Mars once had life. InSight, a robotic lander which arrived on Mars last November, is studying the internal structure of the planet - looking for signs of quakes and measuring the temperature below the surface. The next craft planned to be sent to Mars is in 2020 and will feature a helicopter like a drone has. It will fly over the planet and study the surface with a high resolution camera. Poniros also explained the complex series of actions which needed to be pre-programmed and executed flawlessly to ensure a safe landing. Just a few of these steps included a heat shield which will get as hot as the sun when entering Mars’ atmosphere and then has to be discharged from the lander, a parachute which slows the descent from 12,000 miles per hour to 150 miles per hour and then airbags which protect it during a five-story drop onto the surface. While a trip to the moon and back could be done in about eight days, a trip to Mars and back would take 32 months, which requires a lot more provisions. Scientists at the International Space Station are practicing planting seeds and growing crops, hoping that Mars could be prepared for human astronauts before they arrive. Posted in The Bristol Press, General News, Plymouth, Terryville on Wednesday, 6 February 2019 20:10. Updated: Wednesday, 6 February 2019 20:13.